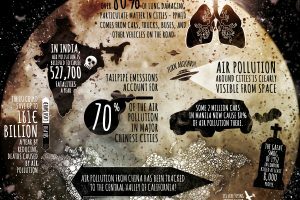 The design for this infographic is a map of the world that shows little boxes pointing to the countries with their respective lucky and unlucky numbers. I think this was a good way to show the different numbers so that you could actually see where around the world the numbers are different. I like that there is an explanation about the numbers in each area. The only issue I do have is that it is visually boring to look at . The colors and text blend into each other and the only thing that really stands out are the numbers. I think it would have been nice to color code the numbers to match their respected regions on the map. Other than that I think the infographic has a nice map design to help readers better understand the regions of the numbers. The information seems to give exactly what the title suggests. 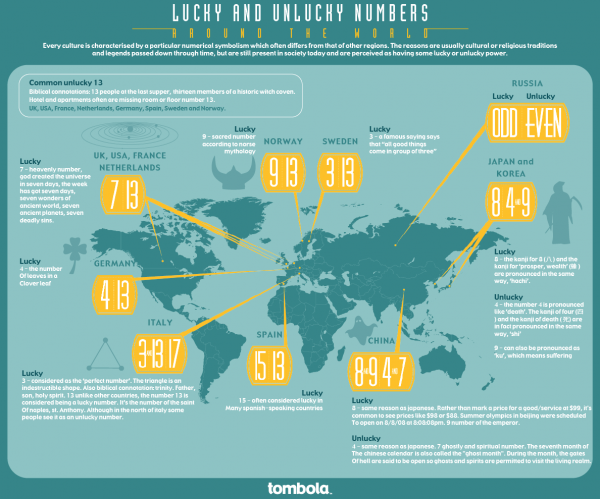 The lucky and unlucky numbers are shown for different areas around the world and a little snippet about why those numbers are lucky are unlucky are included. Other than that there is not much else to read about. 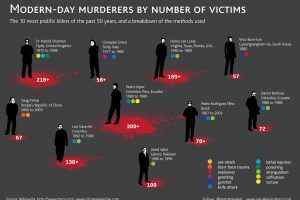 I think adding a little more information about what the people of the different areas use the numbers for and maybe included a graph that showed a list of the most popular lucky and unlucky numbers. These of course are just suggestions because I just felt like something more could have been added to the information.